“Don’t like the weather? Just wait a minute.” That old joke is, unfortunately, becoming truer and truer for our partners in the coffeelands, whose once-predictable harvest seasons have been changing year by year as global temperatures increase and other weather patterns alter the usual timeline for coffee growing. Generally speaking, however, the world of coffee agriculture still operates in two “semesters,” and we are roughly able to assume when we will start to see coffees being harvested, processing, and shipped around the world. The schedule provided below is an estimate, including both main crop and, where applicable, fly crop in places where that smaller secondary harvest occurs. Following harvest and processing, coffee will typically “rest” at origin for 30–60 days before shipping out of its country of origin—though your mileage may vary. The old logistics joke, “It takes about 6 weeks to get from anywhere to anywhere,” is pretty true shipping from coffee producing countries, but there are countless variables involved in the transport, and nothing in coffee is hard and fast. The chart also displays a prediction of when our North American offices see arrivals from each country. The Cafe Imports Specialty-Coﬀee Harvest Chart is a user-friendly guide to the typical harvest and arrival seasons for the specialty-coﬀee source areas in which Cafe Imports works. 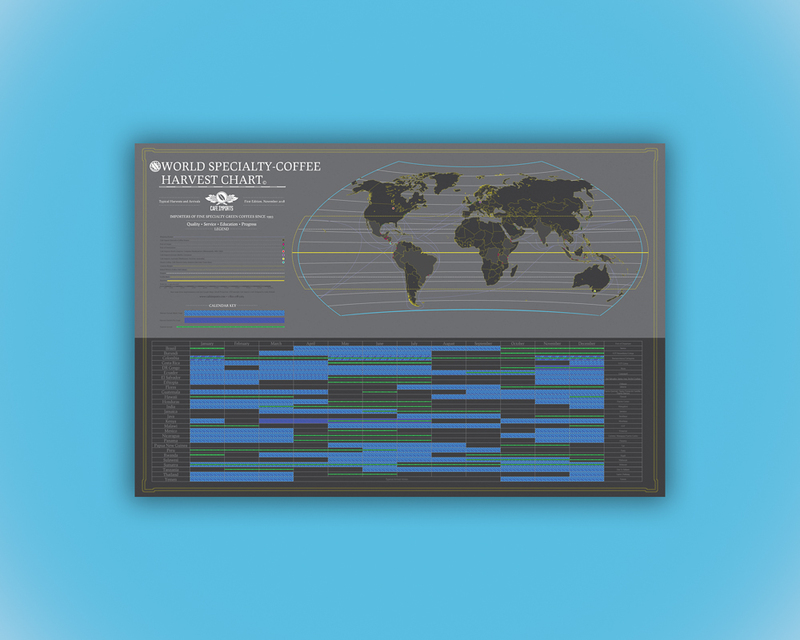 In addition to the calendar of harvest and shipment arrival months, it also includes a world map depicting the primary shipping routes for many of the coﬀees that Cafe Imports buys. It also lists the primary port city for all of our FOB (free on board) and FOT (free on truck) coﬀee shipments. 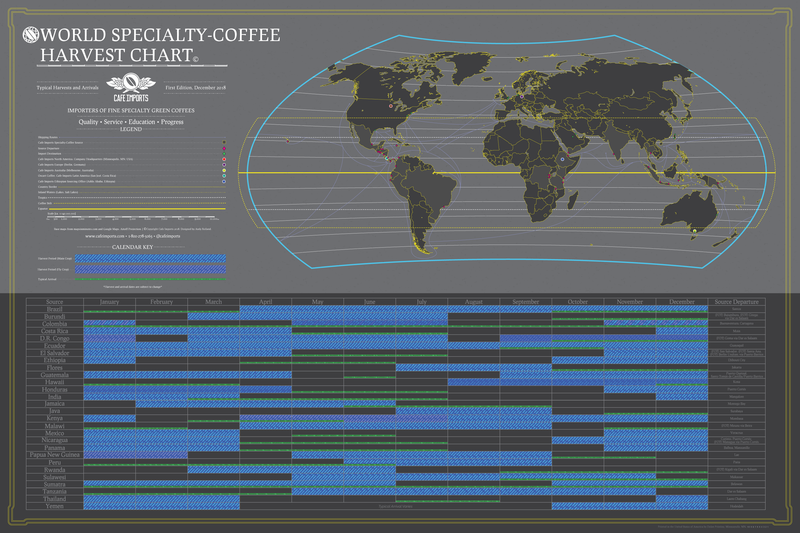 This chart was created as a collaborative eﬀort between the Cafe Imports marketing and green-coﬀee-buying teams, with design and direction by Cafe Imports creative director Andy Reiland. We hope you’ll use it when forecasting your yearly coﬀee contracts, daydreaming about upcoming crops, or simply showing oﬀ your deep knowledge of coﬀee-harvest seasons around the world. Scroll to the bottom of this webpage for a web store link to the Specialty-Coffee Harvest Chart, and click the digital elements from this piece below for enlarged views.